In support of the BBC’s programme which tonight features the Painted Wolf I would like to pay my own tribute to this amazing anima, that I first saw in South Africa’s Kruger National Park n 2004. They are stunning creatures to observe and I lost my heart to them. 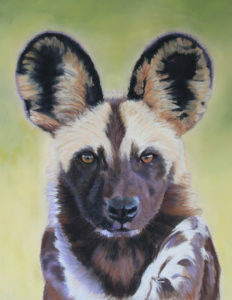 I recently donated the 1st Limited Edition Giclee Print of 25 of my painting of The Painted Wolf to the Painted Dog Conservation. They successfully auctioned it for £200 to help with conservation of this magnificent species and have a further 5 Limited Edition Prints that they plan to auction to help support and conserve this species. The Painted Wolf in soft pastel on PastelMat.